These vegan, dairy free, and gluten free fruit pizzas are so delicious! They are also super fun to put together making them the perfect treat for any occasion! It is officially Spring and today it FINALLY feels like Spring! It’s absolutely beautiful outside today and I am so excited about it! I was really starting to feel the Winter blues so I am ready to go play outside with my kiddos and get some much needed sunshine! Today’s new recipe is the perfect treat for Spring. Not only are these gluten free and vegan mini fruit pizzas delicious, but they are so pretty! The fruit on top adds such a delicious and sweet fresh flavor and the cookie crust is perfectly “buttery”. They are also super fun to put together! My daughter loves helping decorate the cookies almost as much as she loves to eat them. To make the scalloped cookie shape, I used my round cookie cutters I got on Amazon for $6.00. They are so cute and I have used them for so many things already! Below is the kind I have and love. For these cookies I used the largest size in the set, but you can use whatever size you desire. Another super fun gadget I found was this awesome rolling pin that comes with adjustable rings! This is seriously a life saver! I have always had a hard time getting the dough level so my cookies were always different thicknesses. That is no longer a problem with this rolling pin! I highly recommend it if you have any problems getting your dough level. It works great for all kinds of dough! Vegan butter: I use “Earth Balance Soy Free Vegan Buttery Sticks”. Powdered sugar or substitute: I use “Swerve” brand sweetener. Full fat coconut milk: Refrigerate the can of coconut milk overnight. This will allow the liquid to separate from the cream and we only want to use the thick cream for this recipe. Maple syrup: Adds sweetness to the coconut whipped cream topping. Honey can also be used if desired. Fruit: You can use any type of fruit for this recipe. Some of my favorites are strawberries, mandarin oranges, kiwi, blueberries, or raspberries. Refrigerate coconut milk overnight: This will allow the liquid to separate from the cream. We only want to use the thick cream for this recipe. Prepare dough: In a stand mixer with a paddle attachment, beat the vegan butter until creamy. Add in the maple syrup, vanilla, and powdered sugar and mix until smooth. Add the flour and salt to the mixer and mix until a dough is formed. Refrigerate Dough: Wrap the dough in a piece of plastic wrap and place in the refrigerator for 10-15 minutes. Cut Out the Cookies: Use a circle cookie cutter to cut the dough. Place the cookies on a sheet tray lined with parchment paper. Bake: 15-18 minutes or until the edges are lightly browned. Prepare Coconut Cream Topping: While the cookies are baking, open the can of coconut milk and scoop the thick cream that has risen to the top of the can and put it in a large mixing bowl or stand mixer. Using a stand mixer or hand mixer, whip the coconut cream for about 2 minutes. You want a thicker consistency for the coconut cream so don’t over whip it. Refrigerate Topping: Mix in maple syrup and vanilla. Place the coconut cream in the refrigerator for 15-20 minutes to thicken up. Cut Fruit and Decorate Cookies: Prepare your fruit while the cookies are cooling and the coconut cream chills. Once the cookies have cooled, top each cookie with the coconut cream and decorate with fruit. Store: In the refrigerator in an air tight container. Refrigerate the can of coconut milk overnight. This will allow the liquid to separate from the cream. We only want to use the thick cream for this recipe. In a stand mixer with a paddle attachment, beat the vegan butter until creamy. Add in the maple syrup, vanilla, and powdered sugar and mix until smooth. Add the flour and salt to the mixer and mix until a dough is formed. Wrap the dough in a piece of plastic wrap and place in the refrigerator for 10-15 minutes. Unwrap the dough and transfer it to a piece of parchment paper. Use a circle cookie cutter to cut the dough. Place the cookies on a sheet tray lined with parchment paper. Bake for 15-18 minutes or until the edges are lightly browned. While the cookies are baking, open the can of coconut milk and scoop the thick cream that has risen to the top of the can and put it in a large mixing bowl or stand mixer. Using a stand mixer or hand mixer, whip the coconut cream for about 2 minutes. You want a thicker consistency for the coconut cream so don’t over whip it. Mix in maple syrup and vanilla. Place the coconut cream in the refrigerator for 15 minutes to thicken up. Prepare your fruit while the cookies are cooling and the coconut cream chills. Once the cookies have cooled, top each cookie with the coconut cream and decorate with fruit. Store the mini fruit pizzas in the refrigerator in an air tight container. You can also make a traditional fruit pizza using this recipe if desired. Cook time may need to be adjusted depending on the size you make. 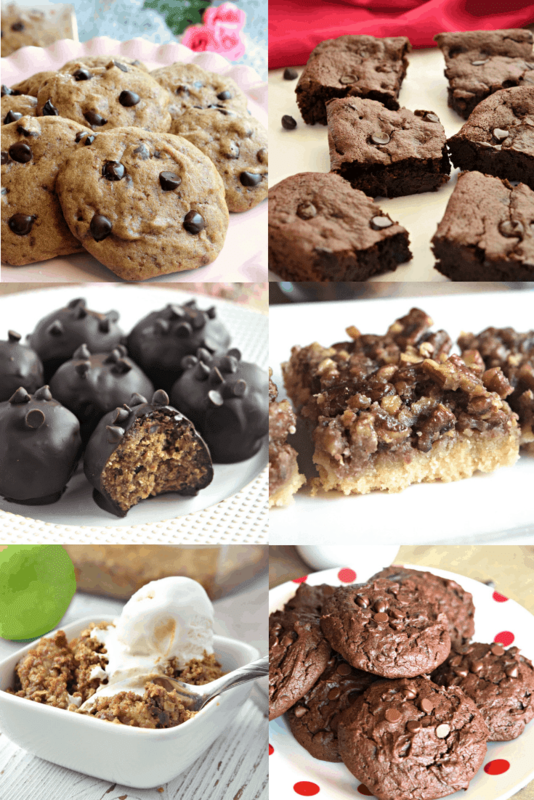 LOOKING FOR MORE DELICIOUS GLUTEN FREE AND VEGAN COOKIE RECIPES? CHECK OUT SOME OF MY FAVORITES BELOW!